A true Lennon and McCartney hidden classic. The original recording, all boom and bluster, hides the romanticism of McCartney dancing with the mysticism of Lennon. The production of this song on the “Please Please Me” album is a poor man’s version of a Phil Spector session. The dramatic dotted figure of the drum and bass (Boom-b’-Boom, Splat) which reiterates in the background overpowers the subtle nature of the song. “There’s A Place”, like many of early Beatles songs started life at McCartney’s childhood home on Forthlin Road. Paul had picked up a copy of West Side Story, perhaps after seeing the movie at his local cinema, and was determined to rip off Leonard Bernstein for all he was worth. Remember immature artists plagiarize, mature artists steal*. I’m sure Paul intended to write a song with a similar romantic sentiment. Lennon turned that sentiment on its head making the song about what goes on inside his head. When I feel low, When I feel blue. Standing outside of time and space while literally only existing in his own imagination. Self centered and selfless at the same time. Don’t you know that it’s so. The Ukulele version, by “Little Fish” is closer to the Lennonesque vision. It captures the internal world perfectly. The minimal arrangement sounds like thoughts echoing around an almost silent mind. The Phil Spector beat is now a heartbeat. The harmonies are stripped away to leave a solitary voice talking to itself. Juju Sophie is a natural rock star. The first time I saw her and her band “Little Fish” perform was at Terminal 5 in New York supporting Courtney Love’s “Hole” in font of 3,000 people. Support acts of major stars in large venues are often derided or worse ignored by the audience. What I witnessed was nothing less than remarkable. Within 5 minutes of being on stage Courtney’s faithful were won over. In that same audience Debbie Harry was equally impressed and invited the band to support Blondie on a UK Tour. 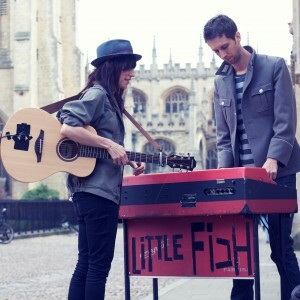 Little Fish are currently taking a break from recording their latest album to tour France, Turkey and China. Why would they do a thing like that? Little Fish is a band from Oxford fronted by Juju, a singer with the passion of Patti Smith and the versatility of PJ Harvey. Their debut album, Baffled and Beat, was released on Custard/Universal in 2010; last year they left their label to make more interesting records in a bungalow garage in Oxford, and publish a crowd-funded book about rock’n’roll. They have toured with Supergrass, Spinerette, Juliette Lewis, Alice in Chains, Placebo; Debbie Harry saw them supporting Courtney Love and asked them to join Blondie for a UK tour. “Little Fish had the raw rock spark that doesn’t depend on fame,” claimed one New York Times review. Right now they are gearing up to support Roger Daltrey in Paris and Gaz Coombes in Oxford before headlining a show in Istanbul and heading out on a 3-week DIY tour of China.